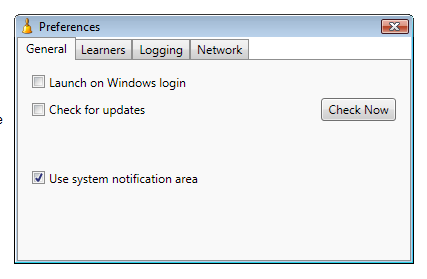 This document describes how to install and use the Jarvis context-sensing application for Windows XP & Vista. Please be aware that Jarvis is still in the early phases of development and will likely be less than 100% stable while I work out the major issues in the initial release cycles. You can help shorten this duration by submitting bugs, crash reports, and other feedback to jarvis@pennyworthproject.org. Each bit of feedback helps me make Jarvis a little bit better. Thanks for giving the software a try! Jarvis is available for download and installation from the link to the left. Clicking that link will download an MSI file to your local system. When the file is completely downloaded, double-click the file to verify that your system is up-to-date and capable of running Jarvis. If your system checks out, it will install Jarvis. After the installation is complete, you can launch Jarvis by finding and clicking the new Jarvis group entry in your Start Menu. This icon is the main way that you will interact with Jarvis. If you right-click the icon, a menu will appear, exposing the functionality that Jarvis provides. When Jarvis first starts, it has not had the opportunity to learn how to interpret sensor information to generate models that describe your context. 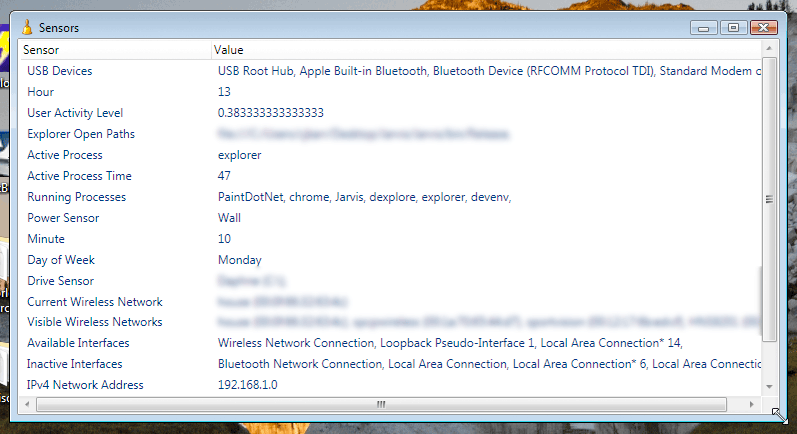 To view the sensor information that Jarvis collects, click the Sensors... item in the menu. This is how Jarvis "sees" you. To begin training a model, open up an application and hit the Ctrl-Alt-C key combination to bring up the training window. 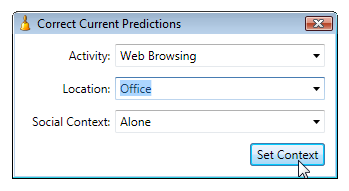 Enter values that describe your current context. Now that you understand how to use Jarvis, you can continue training it by invoking the Ctrl-Alt-C hotkey anytime Jarvis is running to teach it your contexts. It may take several teaching examples, but over time, Jarvis will become better at predicting your context automatically. 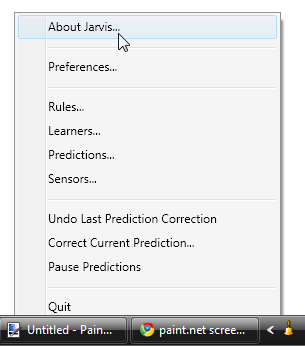 As mentioned above, this is an early release of the Jarvis context-sensing application. Many features are still under development and will be made available in subsequent releases. If you are interested in following Jarvis development, consider adding the Pennyworth Project's weblog to your RSS reader or bookmarks. New Jarvis releases will be publicized there. If you encounter any problems running this application, we would appreciate your feedback. The best way to pass it on is to e-mail jarvis@pennyworthproject.org. we would like to hear about any feedback that you may have.